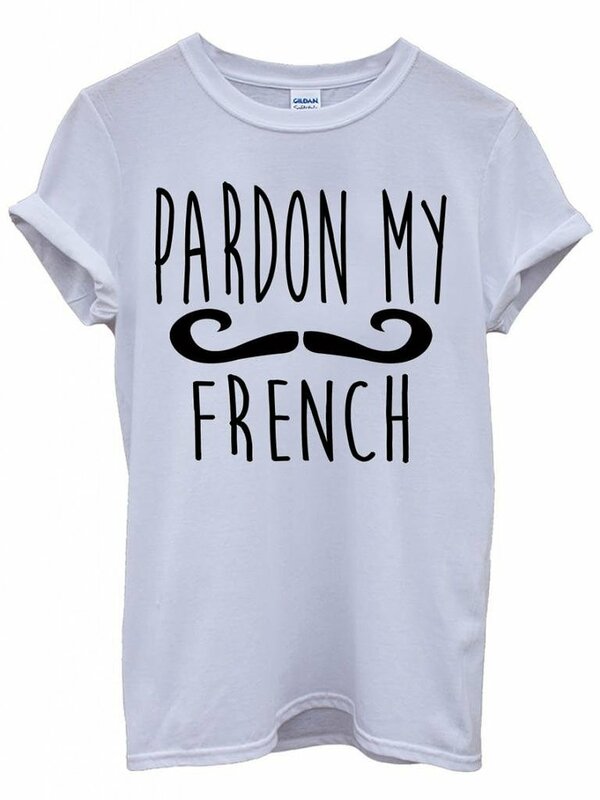 The phrase “Pardon my French” is popular enough that it is common on T-shirts. Buy your own! Last week my brother was telling me a story that took place at his work. Somebody had, jokingly, insulted a coworker using a long string of profanity. “What did you say?” the recipient had retorted, pretending to be offended. We’ve all made jokes like this. The phrase “Pardon my French” has even entered the English vernacular, as a way to ostensibly disguise profanity. “There probably isn’t even a word for sauerkraut in Portuguese,” was my response when my brother told me the story. It turns out I was wrong (sort of–more on that in a moment). The Portuguese word for sauerkraut is “chucrute“. But would you believe me that there isn’t an English word for sauerkraut? And you’d be right. Sort of. If you’re thinking “Okay, so sauerkraut is a loanword from German. So what? Now it’s an English word, too!” you’d also be right. Sort of. 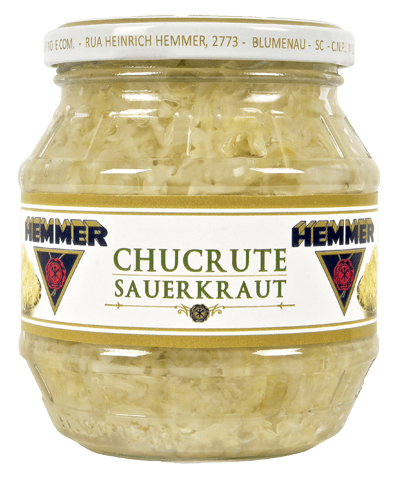 Jar of Chucrute / Sauerkraut sold by Hemmer in Brazil. Remember how a moment ago I said I was “sort of wrong” about Portuguese having a word for sauerkraut? Well, Portuguese has the word “chucrute” which means the same thing as sauerkraut in German (and English). But it’s not really a Portuguese word, either. It’s also a loanword. This time from French. “choucroute” is the French word for “A dish made by fermenting finely chopped cabbage”. But wait! It’s not really a French word, either! The French borrowed the word from the Alsatian dialect of German, which in turn got the word from German ‘sauerkraut’. You might think that of the languages thus far discussed, English, Portuguese, French, Alsatain and German, only English directly borrowed the word from another language. The others each made slight changes to the word along the way. In reality, English made some changes, too, which is clear if you compare the English pronunciation with the German pronunciation. And in fact, almost every loan word changes at least a little when it moves from one language to another. Ask a native Mexican to say “taco” and it will sound slightly different than when a native English speaker does it. “Loanword” is not a black-and-white concept. There is an entire spectrum of loanword classifications. The “strictest” form of a loan word is a classified as a “foreign word”–where we use a foreign word directly, without integrating it into the language–like “sauerkraut”. When Alsatian turned “Sauerkraut” into “Sürkrüt” “French turned “Sürkrüt” into “choucroute”, and Portuguese turned “choucroute” into “chucrute,” these were all examples of a slightly more liberal “loan word” processes. A typical view of languages, at least from a mono-lingual American viewpoint, is somewhat analogous to a map. A typical view of languages, with distinct borders between them. We tend to compartmentalize languages. “Dog” is English. “Gato” is Spanish. “Je t’aime” is French. “空” is Japanese. I prefer to take a different view. And I encourage you to change your thinking and join me. As we have seen above, with a brief study of everyone’s favorite fermented cabbage dish (no offense, kimchi lovers! ), languages are intertwined. Almost all of English vocabulary comes from other languages–roughly 45% from French. That is to say, there are very few truly “English” words–words of actual English origin. What we call the “English language” is constantly changing. It’s always being influenced by other languages–and in turn it is influencing other languages. I think rather than compartmentalizing language, as we do national boundaries on a map, it’s much more accurate and useful, to think of languages as flowing together. 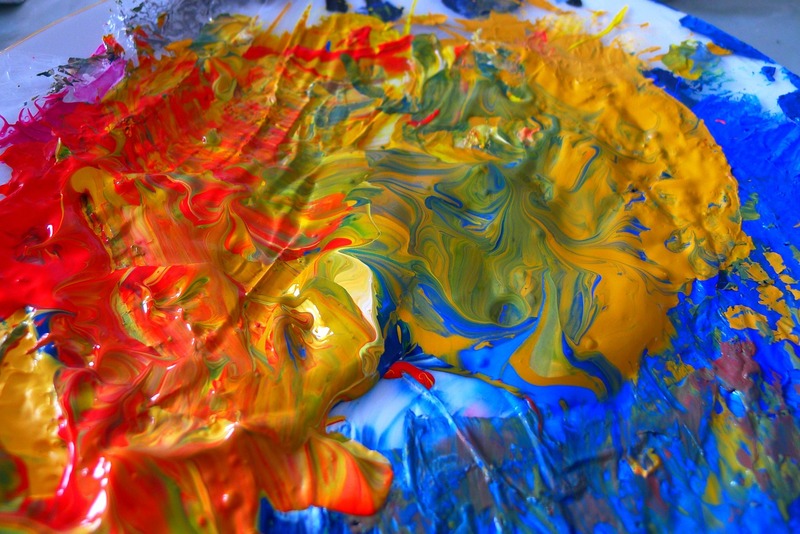 Language flows like paint swirls. Where one language ends and another begins is often impossible to determine. Once you make that mental shift to seeing all languages as related, it makes your world both larger and smaller simultaneously. It makes the world larger in the sense that you realize you can never learn all of our “own” language. English is a huge language. And it changes every day (and that’s not just rhetoric! It is constantly changing in real, observable ways!). It also makes the world smaller by realizing that other languages are not so distant. Spanish isn’t “another language”. It’s more like “another shade” of language. You already know a lot of Spanish without realizing it (burrito, café, insubordinación). You also know a lot of French (café, fiancée, proposition), German (sauerkraut, gesundheit, fest), Italian (a cappella, finale, riviera), and Japanese (豆腐 (tofu), 醤油 (soy), 禅 (zen)). Don’t be afraid to learn more. It is this mindset that lead me to subtitle this blog “Passionate about Language” rather than “Passionate about Languages.” While it’s convenient to talk about languages as distinct entities, as a student of language, I believe it’s much more appropriate to think about language as a single art form.